Direct Metals offers expanded metal that is a versatile and economical product made from a high-quality sheet. Our expanded metal sheet is available in many sizes, openings, and material types. You have the option to choose from many materials, such as aluminum, carbon steel, galvanized steel or stainless steel. This metal sheet is uniformly slit and stretched, forming diamond-shaped openings in the sheet that allow for the passage of light, air, heat, and sound. The strands and bonds of the diamonds in the expanded metal sheet add strength and rigidity. Since no metal is lost in the expanding process, expanded metal is a cost-effective alternative to perforated metal. Standard Expanded Metal is an extremely versatile and economical expanded metal product. It is offered in your choice of material, gauge, and opening size. Standard expanded metal sheets are ideal when a raised, slip resistant surface is needed. It is available in aluminum, carbon steel, galvanized steel, or stainless steel. Flattened Expanded Metal is cold rolled through a machine that flattens the expanded metal after the expansion process. Flat expanded metal is the best choice for when a smooth surface is desired. Direct Metals stocks flattened expanded metal in a wide variety of materials, thicknesses and opening sizes. 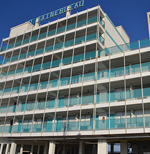 Architectural Expanded Metal is an economical choice. Expanded metal sheet can be adapted for use in just about any architectural metal project. Direct Metals stocks architectural expanded metal in aluminum, carbon steel, and stainless expanded metal. We also offer a variety of sizes, weights, and finishes for the expanded metal. Architectural expanded metal sheet is available in flattened or standard styles. 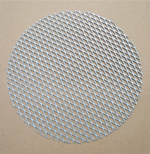 Micro Expanded Metal is suitable for use in filters, as well as several other applications. 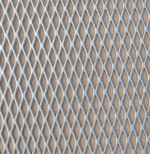 This type of expanded metal features small openings in a lighter gauge sheet of metal. 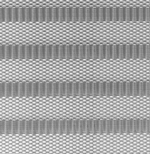 Micro expanded metal sheet is available in standard, flattened, and hexagonal patterns. 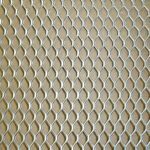 Ribbon Mesh Expanded Metal is an architectural expanded metal with solid bands of ribbon-like contoured shapes that are built into a metal sheet. 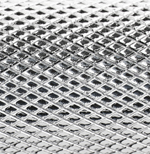 Direct Metals provides ribbon mesh expanded metal in a variety of patterns and materials. Custom Fabricated Expanded Metal is stocked in various patterns and can be custom fabricated to unique shapes and sizes. Some of these expanded metal shapes include a circle, rectangle, and oblong. Materials that can be fabricated include aluminum, carbon steel, galvanized steel, and stainless steel. 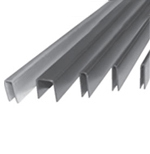 U-Edging is an expanded metal product accessory that is a u-shaped strip attached to the edge of a expanded metal product sheet to make the edges more attractive and safer. It is available in carbon steel, stainless steel, aluminum, and galvanized steel. Q: What types of materials are made into expanded metal sheet? A: There are many types of materials that can be made into expanded metal sheet. Aluminum expanded metal, carbon steel, galvanized steel, nickel, silver, copper, and stainless expanded metal sheets are available. Q: Why is the percentage of open area important for expanded metal sheet? A: The percentage of open area determines the amount of space available for the passage of air, water, and light through the expanded metal sheet. This information is important for engineers to know based on the end application that the expanded metal sheet is used for. Q: What are common applications for expanded metal? A: Expanded metal is extremely diverse. One example of a common application is security mesh for the protection of industrial machinery and electrical equipment, or unwanted access to restricted areas. Some other applications for expanded metal include railing mesh, fences, vents, and shelves. Heavy carbon steel expanded metal can be used as stair treads for oil tanks, working platforms, corridors and walkways. Expanded metal is also used in the construction of roads, bridges, railways, ramps, and steel flooring. Q: Why is expanded metal commonly used? A: The many small openings in the expanded metal material allow flow through of air, water, and light, while still providing a mechanical barrier to larger objects. Another advantage to using expanded metal as opposed to plain sheet metal is that the exposed edges of the expanded metal provide more traction, which has led to its use in catwalks or drainage covers. Q: What do SWD and LWD mean in reference to expanded metal sheet? A: SWD stands for Short Way of the Diamond and LWD stands for Long Way of the Diamond. These acronyms are used when ordering expanded metal sheet. Q: What is your pricing for expanded metal? A: Direct Metals offers an expansive inventory of expanded metal products, each with different pattern options, material types, and finishes. Therefore, it is best to call our sales department for pricing information. Our Direct Metals team members are experts in our expanded metal inventory and can provide you with product recommendations.